So many things give me joy in life, and overnight anything is one of them. If I can prep something the day before and easily (breezily) wake up in the morning to something delicious. I’m in. 100%. Which is exactly what happens with these Yeasted Overnight Waffles. We whisk together the ingredients the night before (flour, yeast, milk, butter and sugar) and let the mixture mingle overnight. 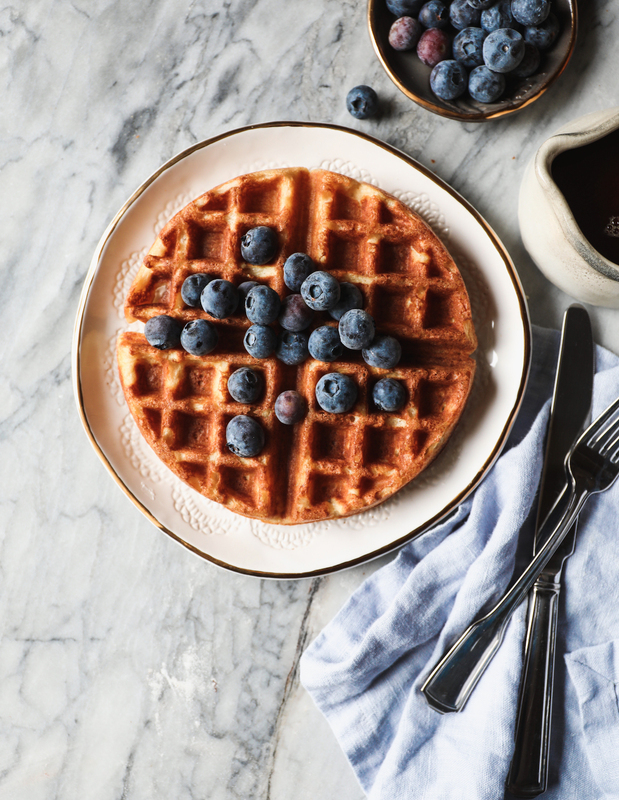 When you wake up in the morning, you whisk together three eggs with some leavening and voile, you’ve made yourself the easiest, fluffiest, crispiest batch of waffles in the same amount of time that it takes you to open a bottle of champagne and make your way through one glass. In the wise words of Ina Garten: how easy is that? I really like the taste of my Beefy Buttermilk Waffles (we love this recipe if you can’t be bothered with yeast) and so I wanted these to have a similar vibe, but prepped the night before. I’ve been futzing with this recipe since pre-Christmas and I’m so happy she’s finally ready for you!! FLOUR. I use a combination of all-purpose flour and white whole wheat flour for these. This latter flour offers wonderful flavor. 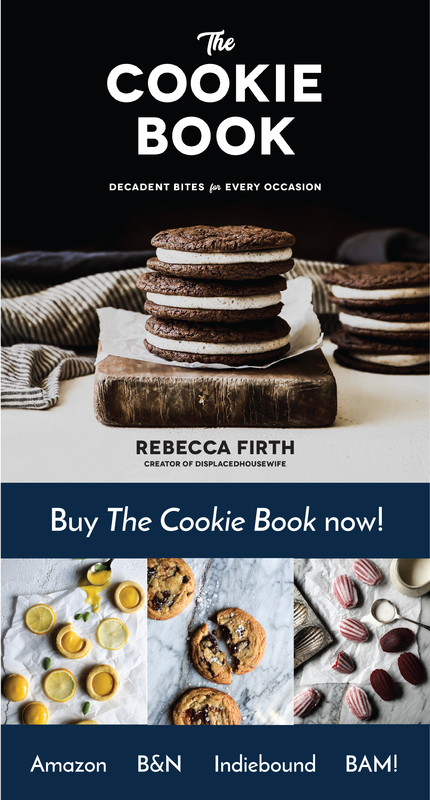 I use white whole wheat flour often in recipes (think cookies), so I hope you’ll pick some up. I use King Arthur’s White Whole Wheat which has 15% protein…if you’re going to swap in another flour, try to keep it around that protein level. YEAST. I tested this recipe with both store bought yeast and my sourdough starter. I give you the quantities for both below. If using store bought yeast, grab active dry yeast. If using your sourdough starter, make sure it’s active and ready to go. My favorite way to check this is by dropping a small bit into a glass of water. If it floats, it’s ready to go! TEMPERATURE. When you melt your butter and milk together, make sure that the temperature of the mixture isn’t screaming hot when you put the yeast in. The ideal temperature for yeast is around 100F to 115F (37C to 46C). If you don’t have a thermometer, stick your finger in it. If it burns or feels hot, let it cool off a bit before adding the yeast. You want it to feel just warmer than your body temperature. 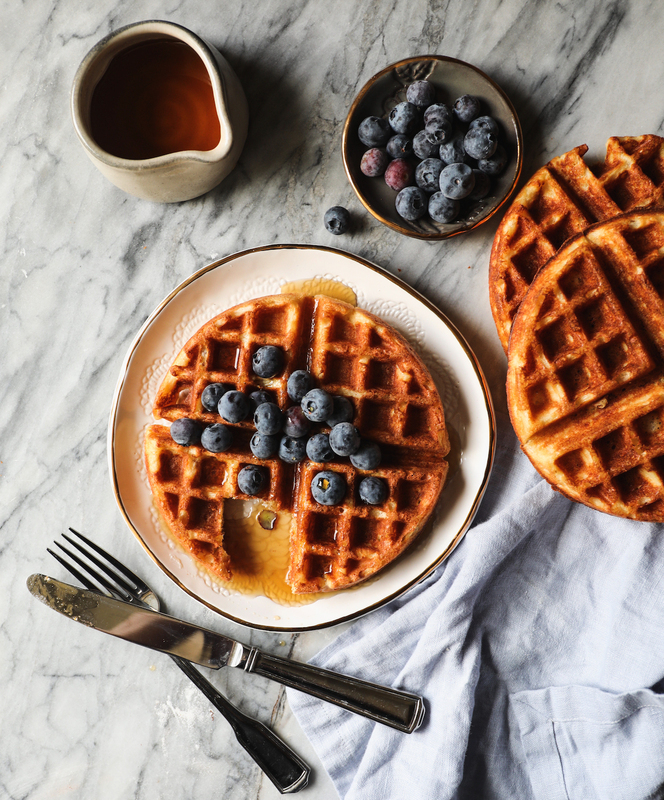 One other temperature note…if the ambient temperature in your home is over 70F (21C) then keep the waffle batter on the counter for just several hours and then cover and place in the fridge overnight. WAFFLE MAKER. My waffle maker isn’t on the market anymore, but this one looks pretty comparable. The double-sided, two-waffles-at-once schtick is a game changer. WEIGHT. I’m adding weight measurements in here so all of my overseas, out-of-the-US followers will have an easier go at it. I’m going to do this from now on with my recipes, feel free to use either measurement method. GRANOLA. If feeling frisky, add 1 cup of granola to the waffle batter (omitting any nuts or big, hard chunks). Weird, but SOOOOO GOOD. TIMING. You start this recipe the night before, so just make a mental note of that. If you want immediate satisfaction, head over to this waffle recipe. Let’s make some fabulous overnight waffles, shall we? 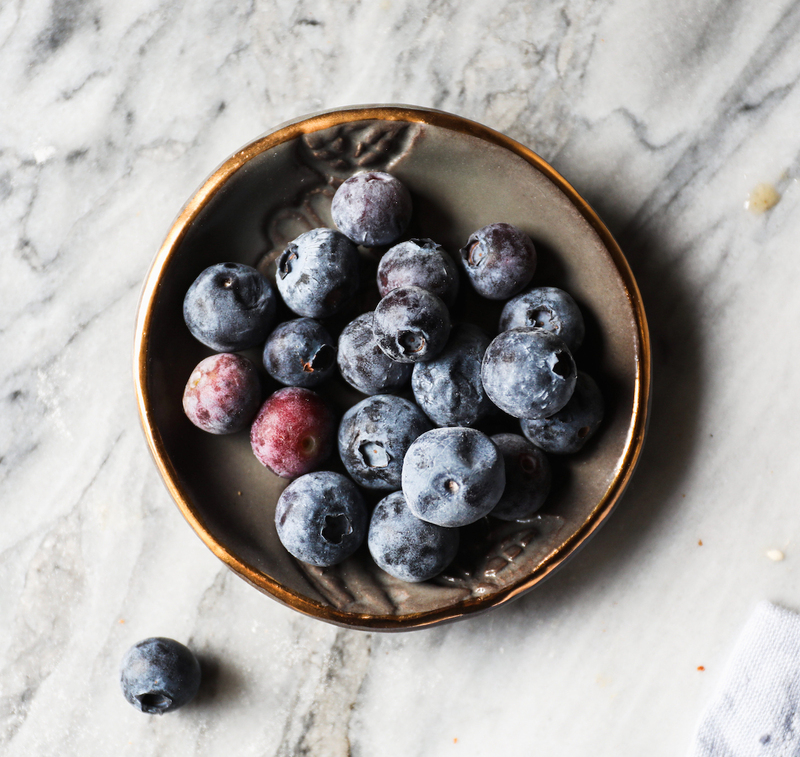 To Serve: Real maple syrup, blueberries and all of the toppings that give you joy. My kids like a dusting of powdered sugar over the tops of theirs because apparently you can never have too much sugar. The Night Before: In a large microwave-safe bowl add the milk and butter and run the microwave on high until the butter is melted. This takes a little over a minute in my microwave. You could also do this in a medium saucepan over medium heat on the stove. Stick your finger in the liquid, if it feels hot, hold off adding the yeast until it gets closer to body temperature. If it feels cozy and warm, the yeast will likewise find it cozy and warm. Once the temperature feels right, add in the yeast or starter and let it sit for five minutes or so. The yeast should get a bit frothy. When this happens, add in your sugar, vanilla, all-purpose flour, white whole wheat flour and sea salt and use a whisk to fully incorporate the dry ingredients into the liquid. This is completely contrary to the way you mix traditional waffles (they’re best when the batter is a bit lumpy). Ignore the instinct to leave it lumpy, and blend completely. Cover with plastic wrap and let sit on the counter overnight. Waffle Morning: Turn on your waffle iron to get it nice and hot to yield the crispiest waffles. On my maker, that means the temperature is set to 4 1/2. If your waffle iron isn’t nonstick, brush the top and bottom with melted butter. In a medium bowl whisk together the eggs, baking powder and baking soda and then fold into the waffle batter until blended. Pour the batter* into your waffle iron (my waffle maker takes about 1/2 cup) and set the timer on 4 minutes…your waffle maker may cook faster or slower. Use that number as a ballpark depending on whether your waffle iron runs hot or cool. If you’re serving a crowd, you can double the recipe and have the oven on a low 200F/93C. Set a cooling rack on top of a cookie sheet and place in the oven. Set the finished overnight waffles on the cooling rack in the oven as they come out of the waffle iron. Ideally, you serve the overnight waffles as soon as they come out of the waffle iron. They’re best that way. We like to sprinkle with powdered sugar. It looks pretty. Always 100% pure maple syrup in our house. Sometimes we sprinkle with fruit so it’s transformed into a pious breakfast fit for Gwyneth. 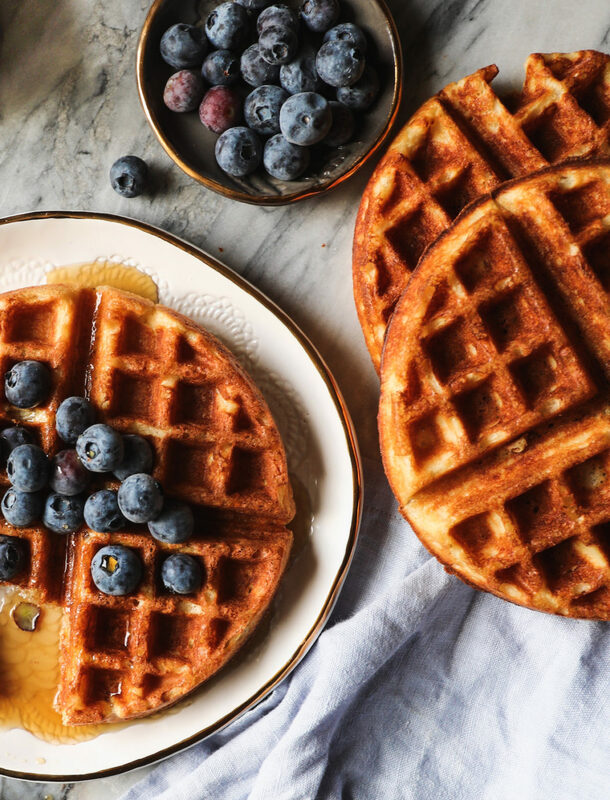 Thank you for making these overnight waffles! Tag me on social @displacedhousewife #displacedhousewife if you post them! *How much batter you put into your waffle maker depends on the size of said waffle maker. The holidays were great. Life has slowed down a bit and I have completely immersed myself in my sourdough starter. On one of my trips to NY this past fall Erin (Cloudy Kitchen) gave me some of her dried starter. I resuscitated it and it has been working fabulous. I’ve been making bagels, soft pretzels, sourdough loaves and, yes, heaps and heaps of overnight waffles. Starting next month I’m going to start doing one challenging recipe for us each month. 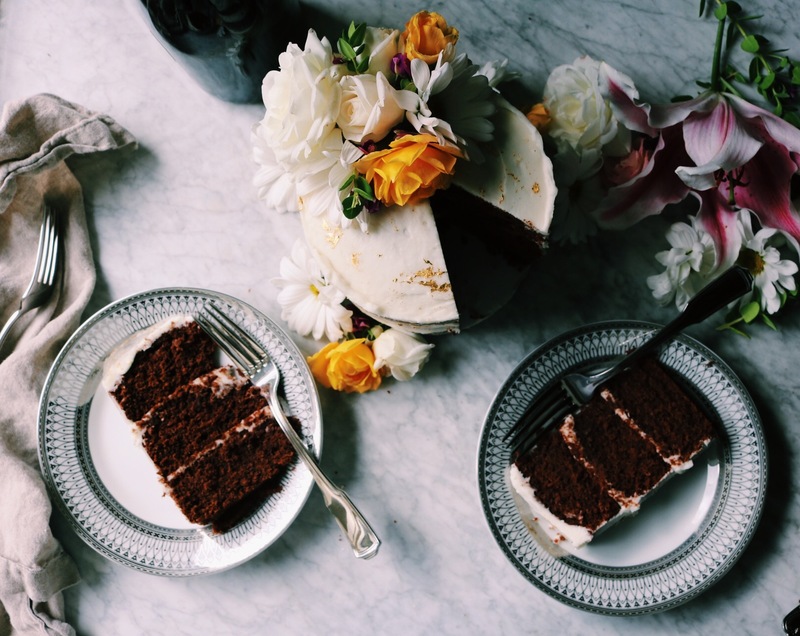 I want us to focus on recipes that we might think might be too much work or complicated, but we can break them down and make them easier…things like croissants, sourdough bread, old-fashioned donuts, the perfect layer cake. I will announce February’s Baking Goal on February 1st. I’m super excited about this so keep your eyes peeled!! I hope the new year has been good to you so far and you’ve been good to yourself. 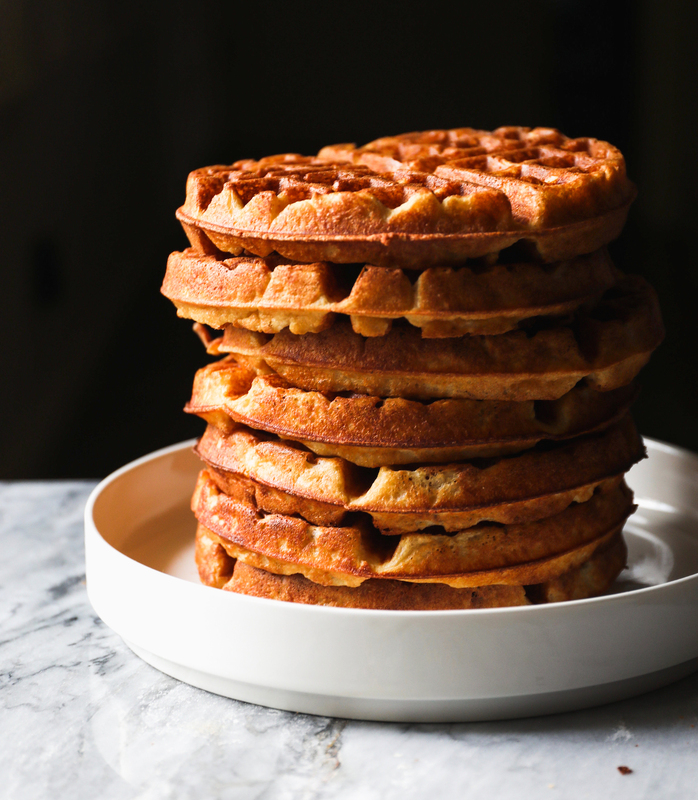 These delicious yeasted overnight waffles are the easiest, fluffiest, crispiest batch of waffles that can be made with hardly any effort. The Night Before: In a large microwave-safe bowl add the milk and butter and run the microwave on high until the butter is melted. This takes a little over a minute in my microwave. You could also do this in a medium saucepan over medium heat on the stove. Stick your finger in the liquid, if it feels hot, hold off adding the yeast until it gets closer to body temperature. If it feels cozy and warm, the yeast will likewise find it cozy and warm. Once the temperature feels right, add in the yeast or starter and let it sit for five minutes or so. The yeast should get a bit frothy. When this happens, add in your sugar, vanilla, all-purpose flour, white whole wheat flour and sea salt and use a whisk to fully incorporate the dry ingredients into the liquid. This is completely contrary to the way you mix traditional waffles (they're best when the batter is a bit lumpy). Ignore the instinct to leave it lumpy, and blend completely. Cover with plastic wrap and let sit on the counter overnight. Waffle Morning: Turn on your waffle iron to get it nice and hot to yield the crispiest waffles. On my maker, that means the temperature is set to 4½. If your waffle iron isn't nonstick, brush the top and bottom with melted butter. In a medium bowl whisk together the eggs, baking powder and baking soda and then fold into the waffle batter until blended. Pour the batter* into your waffle iron (my waffle maker takes about ½ cup) and set the timer on 4 minutes…your waffle maker may cook faster or slower. Use that number as a ballpark depending on whether your waffle iron runs hot or cool. Thanks for the recipe but I have a question.after I fold the egg mixture in how long could i keep the batter? We made these this morning. Best waffles l’ve ever made!!! I used sourdough starter and whole wheat that I ground fresh last night. I did add a tsp of vanilla extract… again, thanks for sharing this our new waffle recipe! 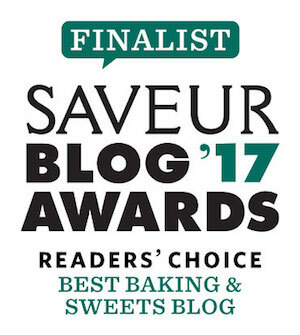 Do you have a recipe or blog post about your sourdough starter? Thanks! Can I use the batter to make pancakes? I don’t have a waffle iron. We didn’t, but then your recipe landed in my inbox. Yay! I’m thinking I might have to get these going tonight for breakfast tomorrow. Thanks so much, Rebecca! Oh my gosh Rebecca, these look so dreamy! These look soooo good cant wait to try out the recipe, keep it up.